Veterans of the Cheltenham Camera Club like Eric Franks remember hearing a similar talk some years earlier without the H. The 1946 talk was not really a talk but as the chairman Dudley Johnston put it “a lively discussion”, a question and answer session with some noted Pictorialists including Dr. Jouhar we have recently had the chance to hear about in this group. The discussion with the Pictorial Group was on the occasion of one of his rare exhibitions and is invaluable to a researcher although it is not a prepared text. The crucial text also comes from The Photographic Journal and is “Confessions of a Reformed Pictorialist” of 1942, a carefully crafted text of seminal importance. There is also an excellent short article, presumably by Richard Gee in ‘The Masters of the Miniature’ series in the Fountain Press Publication “35mm Photography” in 1958, the year before his death. To people of my generation his name will ever be associated with Focal Press and its charismatic owner Kraszna-Krautz who was his friend and publisher. Before the war, when Focal Press was in its infancy, came “Photographing People”. Then in 1940 came a rapid succession of little booklets which were so cheap, so informative and a beacon for tens of thousands of young photographers. Two of Hugo’s titles were “All About Landscapes and Your Camera” (No.7) and “All About Pictures in Town” (No.25). First published in 1940 they were reprinted for years, 5000 at a time, virtually unaltered except for a revision of the illustrations round 1948 until they achieved sales figures respectively of 75,000 in 1949 and 20,000 in 1952 and this was not the end of their life. They are excellent basic books but not actually a mine for the researcher since they were very basic and because of Kraszna-Krautz’s policy of using a range of photographers to illustrate each text. There are some photographic gems tucked away in all of the booklets and they appear in the 50 or so similar booklets by other authors. The indispensable Focal Press book is “Wayside Snapshots” of 1947 because this is one of the rare Focal Press monographs with every photograph by the author. I think I have given enough so far to show that at some time Hugo’s life changed dramatically. We can date the beginning of this change to 1925. 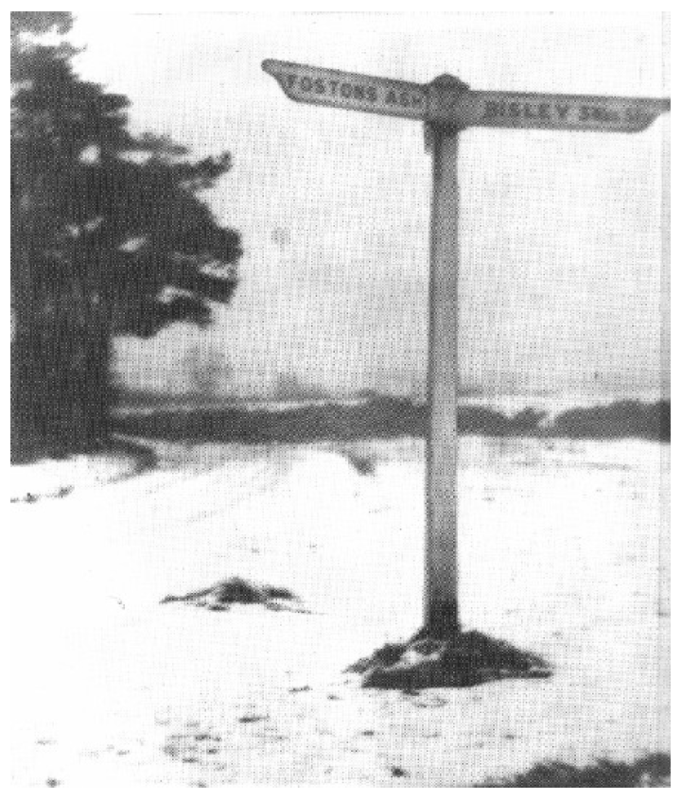 Signpost in the Snow, near Whiteway. Winter c.1923-4. By Hugo van Wadenoyen. Hugo was a very private person, he never spoke of his mother and among the few remarks he made about his father was one which suggests why he left the family business. “He never succeeded in becoming a professional in any real sense – he was too un-businesslike and his taste was far too good”, (1947). Like father, like son, one is tempted to add. Hugo left Cardiff in 1925 and gave his address to the RPS as “Nooitgedacht”, Whiteway, Stroud, Gloucestershire. The Dutch name means literally “Never thought of” which I take to have cynical overtones. The house was not a house but a railway carriage bought there by his brother Jack in 1924. Whiteway Colony when it was founded in 1898 was a commune of Tolstoyan Anarchists. They were pacifists not bomb throwers and one of the more pleasant ways to learn about them is to read Anna Karenina and War and Peace or for those, with stronger stomachs, Count Tolstoy’s political pamphlets. The principle on which Whiteway was founded was that nobody should, or did, own the land – the deeds were ceremoniously burned – but everyone could erect a temporary shack.